The driver’s air bags are stored in the steering wheel hub. The passenger’s air bag is stored in the dashboard above the glove box. In certain frontal collisions, your air bags will instantly inflate to help protect you from serious physical injury or death. There is no single vehicle speed at which the air bags will inflate. Generally, air bags are designed to inflate in certain frontal collisions. The air bag Supplemental Restraint System (SRS) reacts to the severity of a collision and its direction. These two factors determine whether the sensors send out an electronic deployment/inflation signal. Whether the air bags will inflate depends on a number of factors including vehicle speeds, angles of impact and the density and stiffness of the vehicles or objects which your vehicle hits in the collision. The air bags are designed to inflate instantly in the event of a certain frontal collisions in order to help protect the driver and passenger from serious physical injury. The air bags will completely inflate and deflate in less than 1/10 of a second. The speed of inflation and deflation protects the driver’s ability to operate the vehicle. This is important in crashes where a vehicle continues to move after an impact and the driver still has some control of the vehicle’s steering, braking, throttle and/or transaxle systems. It is virtually impossible for you to see the air bags inflate during an accident. It is much more likely that you will simply see the deflated air bags hanging out of their storage compartments after the collision. 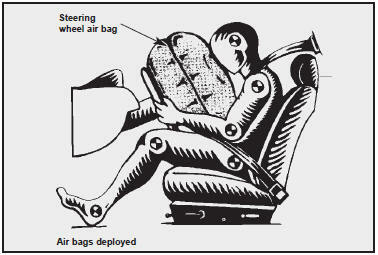 In order to help provide protection in a severe collision, the air bags must inflate rapidly. However, that speed also causes the air bags to expand with a great deal of force. The speed of air bag inflation is a consequence of the extremely short time in which a collision occurs and the need to get the air bag between the occupant and the vehicle structures before the occupant impacts those structures. This speed of inflation reduces the risk of serious or lifethreatening injuries in a severe collision and is thus a necessary part of air bag design. However, air bag inflation can also cause injuries which normally can include facial abrasions, bruises and broken bones. You must always sit as far back from the steering wheel air bag as possible, while still maintaining a comfortable seating position for good vehicle control, in order to reduce the risk of injury or death in a collision. Never place objects over the air bag storage compartments or between the air bags and yourself. Due to the speed and force of the air bag inflation, such objects could hit your body at high speed and cause severe bodily injury and even death. Do not put stickers or ornaments or the steering wheel cover. These may interfere with the deployment of the air bag.